Bushwalking and relaxing are our goals here. 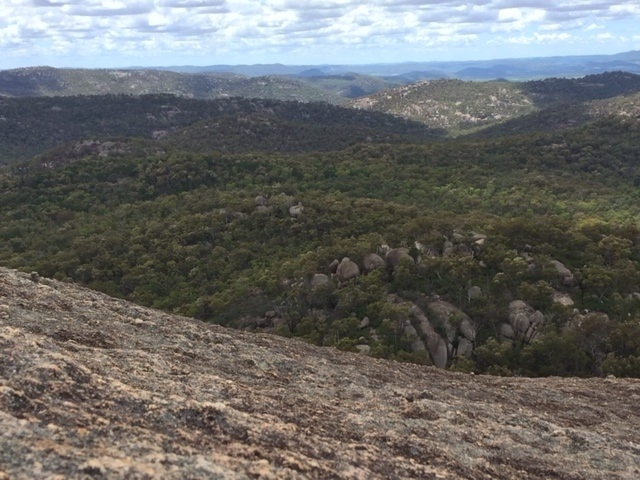 Girraween National Park is fair and square in the granite belt, speaking of ancient volcanic activity. 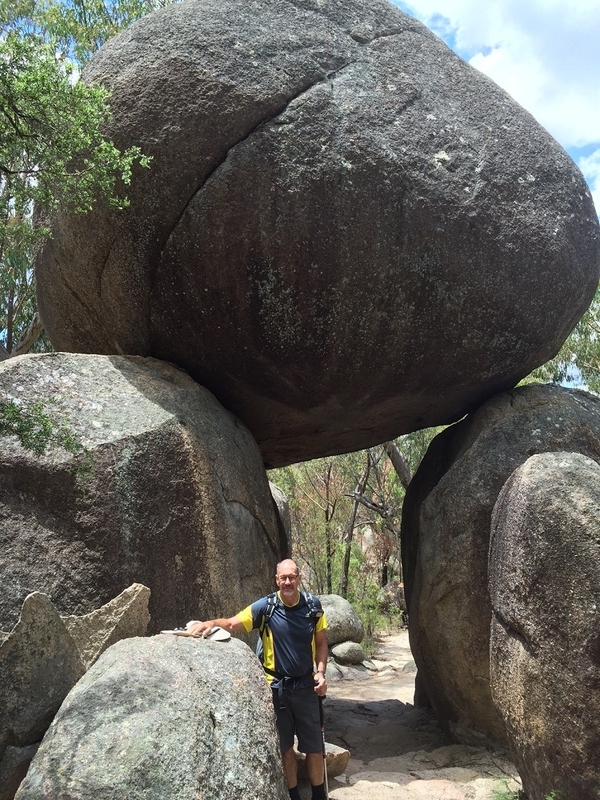 Today the park is covered in enormous granite boulders and granite flows. 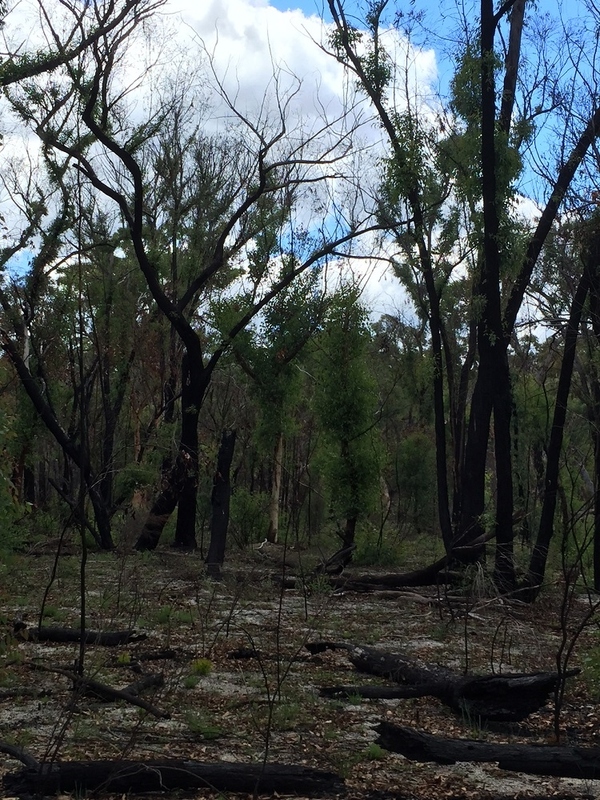 It has several creeks that flow through the park and a pretty good average rainfall of 800+mm annually which supports a reasonably lush sclerophyll bush. Because of its elevation it’s significantly cooler than the plains with average maximum in summer of about 30C. We were lucky with the weather during our stay as you can see. Girraween is an Australian Aboriginal word meaning ‘place of flowers’ and despite a bad bushfire in the park only 3 months ago there are pretty wildflowers and new growth on the trees everywhere. On our first day here we decided to do the ‘moderately difficult’ walks of The Sphinx, Turtle Rock and Castle Rock – which will be about 8 – 9K with the climb to the summit of Castle Rock being graded as ‘difficult’. There was lots of ups and not nearly enough downs and millions of granite steps. They took us past gigantic granite rocks strewn around like marbles, lots of interesting bushes, many of which are flowering with the prettiest little intricate flowers, bird life which was mostly heard rather than seen and lots of delightful Cunninghams skinks. The Sphinx was pretty impressive, and so was Turtle Rock for its sheer size, but you needed a better imagination than I have to make out a turtle shape. Castle Rock was pretty incredible for many reasons, one of which was the effort it takes to climb it. However the views are outstanding and well worth the difficult scrambling and fear-inducing slope down to infinity to see. Granite, just as far as the eye can see. Second day here (Happy Birthday Nick) we had a late leisurely start before completing the walks to the Granite Arch, the Bald Rock Creek circuit and Wyberba circuit. These are easy walks on predominantly flat routes. Bald Rock Creek is unique in that it winds its way around granite rocks and across a granite bed – there are small waterfalls and little rapids. It’s flowing very well at the moment. The Wyberba Circuit took us further downstream where the creek was fairly wide and had a beautiful swimming hole – tempting, but not hot enough for me to swim. 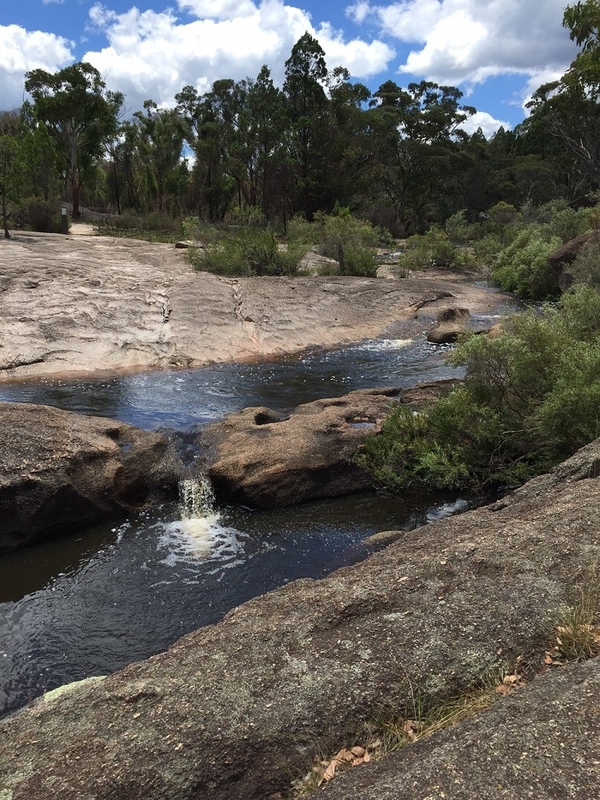 The creeks of Girraween feed the Murray-Darling rivers. Do I see movement? Don’t look up now Steve! Regrowth everywhere after the fires only 3 months ago. 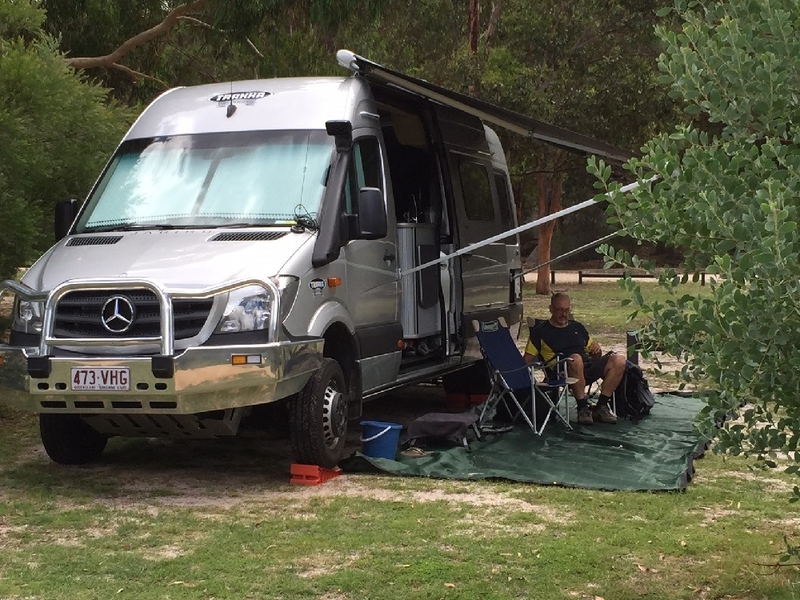 Sitting at our campsite this afternoon within minutes we had spotted magpies, currawongs, kookaburras, fairy wrens, crimson rosellas and heard the songs of others we couldn’t identify. There’s a mob of kangaroos that feed on the short grass in the camping area and a couple of hares that are probably too small to make a good stew! I’m sure as our travels continue we’ll stay in many National Parks. We are indeed blessed with a fantastic network of Parks. 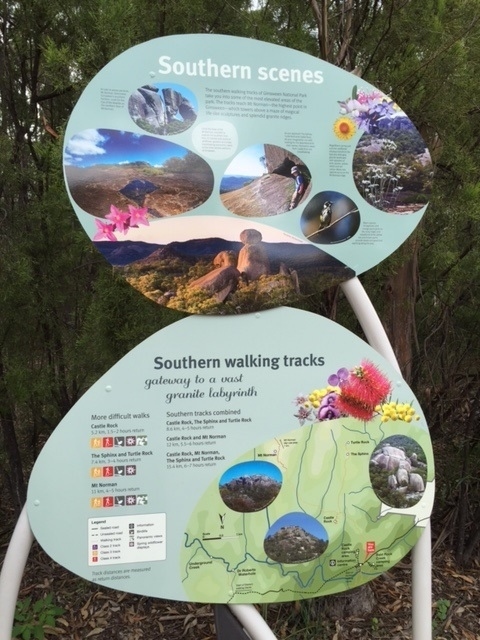 The walks are clearly marked and well maintained – taking in the full range of difficulty to cater for the predominantly sedentary to the keen bushwalker. They have excellent camping facilities with this one having free hot showers, flush toilets (both very clean), large grassy areas for games, picnic tables and BBQs (these are wood BBQs and it is BYO wood). All this for the princely sum of $5.20 per person per night (in Qld, anyway). Our personal slice of heaven. 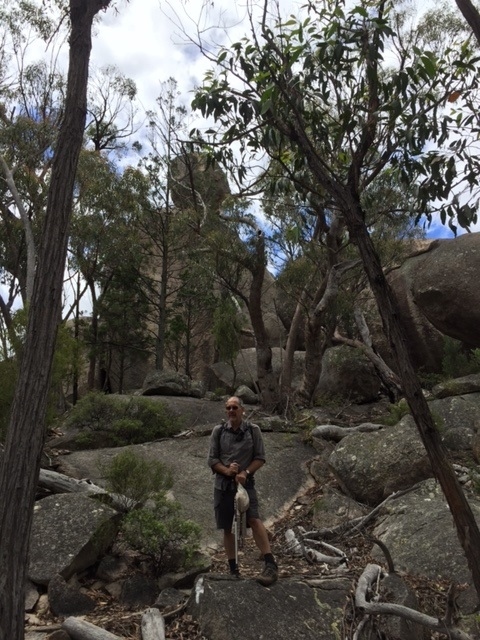 This entry was posted in February - Canberra trip and tagged bushwalking, campsites, Girraween National Park. Bookmark the permalink.